The present study was designed to investigate the therapeutic effects of bee venom (BV) on high-fat diet (HFD)-induced non-alcoholic fatty liver (NAFL) in rats at different levels. Histological manifestations, hepatic lipid content, liver function tests, glucose homeostasis, lipid abnormalities, adipocytokines, lipid peroxidation, disturbed glutathione and antioxidant enzymes systems and dysregulation of Nrf2 transcription factor were assessed. In the present study, the NAFL rats were subcutaneously treated with BV with different doses (0.01, 0.05, 0.1 mg/kg). The results indicated that BV treatment completely normalized the lipid profile values of NAFL rats. Fasting blood sugar, insulin level and homeostatic model assessment of insulin resistance significantly decreased. BV treated rats showed a significantly lower level of all liver enzymes and bilirubin. Moreover, BV treatment significantly increased the levels of active nuclear erythroid factor 2 like 2, glutathione (GSH) (total and reduced), GSH/glutathione disulphide ratio and activities of glutathione reductase, glutathione-S-transferase and glutathione peroxidase (total and Se-dependent). The level of tumor necrosis factor-α was reduced. Treatment showed correction of adiponectin level, and significant downregulation of hepatic triglycerides and cholesterol. At the histological level, BV improved the architecture of liver cells showing normal sinusoids. It may be concluded that BV may represent an interesting therapeutic alternative for the treatment of NAFL disease. Caffeic acid phenethyl ester (CAPE), a bioactive component extracted from propolis, is widely studied due to its anti-cancer effect. Nasopharyngeal carcinoma (NPC) is distinct from other head and neck carcinomas and has a high risk of distant metastases. N-myc downstream regulated gene 1 (NDRG1) is demonstrated as a tumor suppressor gene in several cancers. Our result showed that CAPE treatment could repress NPC cell growth, through induction of S phase cell cycle arrest, and invasion. CAPE treatment stimulated NDRG1 expression in NPC cells. NDRG1 knockdown increased NPC cell proliferation and invasion and rendered NPC cells less responsive to CAPE growth-inhibiting effect, indicating CAPE repressed NPC cell growth partly through NDRG1indcution. CAPE treatment increased phosphorylation of ERK, JNK, and p38 in a dose- and time-dependent manner. Pre-treatments by inhibitors of ERK (PD0325901), JNK (SP600125), or p38 (SB201290), respectively, all could partly inhibit the CAPE effect on NDRG1 induction in NPC cells. Further, STAT3 activity was also repressed by CAPE in NPC cells. In summary, CAPE attenuates NPC cell proliferation and invasion by upregulating NDRG1 expression via MAPK pathway and by inhibiting phosphorylation of STAT3. Considering the poor prognosis of NPC patients with metastasis, CAPE could be a promising agent against NPC. Determine the in vitro efficacy of a honey‐based gel (HBO) against meticillin‐susceptible S. pseudintermedius (MSSP), meticillin‐resistant S. pseudintermedius (MRSP) and M. pachydermatis, by minimum bactericidal concentration (MBC), minimum fungicidal concentration (MFC) and time‐kill assay (TKA). Efficacy of the product's honey component (HO) also was evaluated. Sixty S. pseudintermedius and 10 M. pachydermatis canine isolates were selected. All isolates were tested against serial dilutions of an HBO containing 40% HO (40%, 20%, 10%, 5% and 2.5% w/v) and HO alone (undiluted, 40%, 20%, 10%, 5% and 2.5% w/v). Microbroth assay followed by subculture was used to determine MBC and MFC. The same protocol was applied after product exposure to catalase. A well‐diffusion assay for S. pseudintermedius was used to generate inhibition zones. A TKA for 10 isolates of S. pseudintermedius and 10 isolates of M. pachydermatis was performed. MBC was 20% w/v (5–20% w/v) for HBO and HO. HBO had lower MBC values when compared to HO (P = 0.003). No statistical difference was observed between MSSP/MRSP isolates (HBO P = 0.757, HO P = 0.743). Only HO was affected by catalase (P = 0.015). MFC for HBO was 10% w/v (5–10% w/v) and 40% w/v for HO (20–≥40% w/v). All isolates were killed after 4 h of exposure. 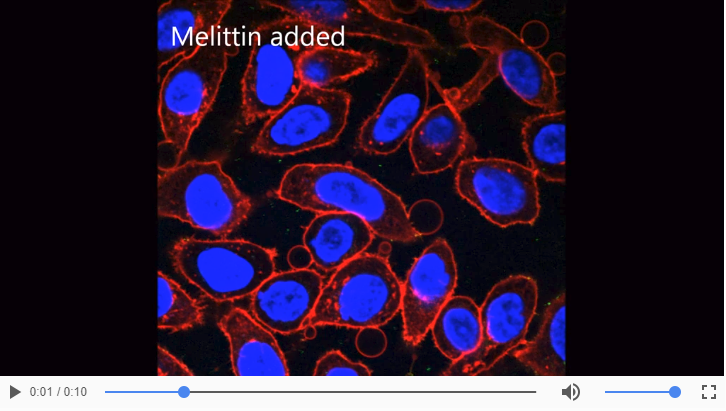 Melittin is the peptide toxin found in bee venom and is effective against cancer cells. To enhance its activity, a branched dimeric form of melittin was designed. The monomeric form of the peptide was more cytotoxic against gastric cancer cells at low concentrations (1-5 μM) than the dimer form, while the cytotoxic effect was comparable at higher concentrations (10 μM). Confocal microscopy showed that both the monomer and dimer forms of melittin with fluorescent label at the C terminus penetrated the cytoplasm and localized at the cell nucleus and disrupted the cell membrane. The results indicated that both peptides localized in the nucleus and no significant difference in penetration was observed between monomer and dimer of melittin. Although the C and N termini are important for melittin activity, using C terminus for dimerization of the peptide resulted in similar activity for the monomer and dimer against bacteria and gastric cancer cells. In this context, rats received daily injection of EEP (100 mg/kg) for 5 days prior to immunization or for 9 days commencing 5 days post immunization with α-Tropomyosin extract, then were sacrificed at day 14. Histological examination, NOS2, arginase-1, and nuclear factor-κB (NF-κB) expression were evaluated in the retinas. Plasmatic production of nitric oxide (NO), urea, IL-4, and TNF-α was assessed. We have found that treatment with EEP substantially reduced the retinal histological damages induced by α-Tropomyosin. In the same context, a significant decrease of NO and TNF-α levels was noticed. Interestingly, EEP down-modulated NOS2 and NF-κB expression in retina. Also, an increase in urea and IL-4 levels was concomitant to an up-modulation of arginase-1 expression. In this study, we investigated the chemical composition, and antioxidant and antibacterial properties of ethanolic extracts of propolis (EEP) from Melipona quadrifasciata quadrifasciata and Tetragonisca angustula. Chemical composition of EEP was determined by colorimetry and chromatographic (HPLC-DAD and UPLC-Q/TOF-MS/MS) analysis. Antimicrobial activity of EEP was evaluated against gram-positive (S. aureus, methicillin-resistant S. aureus, E. faecalis) and gram-negative (E. coli and K. pneumoniae) bacteria by the minimal inhibitory concentration (MIC) test using the microdilution method. Furthermore, the growth curve and integrity of cell membrane of S. aureus and E. coli were investigated using standard microbiological methods. HPLC-DAD analysis showed that the EEP of M. quadrifasciata quadrifasciata has a more complex chemical composition than the EEP of T. angustula. Moreover, UPLC-MS analyses of M. quadrifasciata quadrifascita indicated flavonoids and terpenes as major constituents. The bactericidal activity of both EEPs was higher against gram-positive bacteria than for gram-negative bacteria. The EEP from M. quadrifasciata quadrifasciata presented MIC values lower than the EEP from T. angustula for all tested bacteria. The EEP from M. quadrifasciata quadrifasciata caused lysis of the bacterial wall and release of intracellular components from both E. coli and S. aureus. Our findings indicate that the chemical composition of propolis from stingless bees is complex and depends on the species. The extract from M. quadrifasciata quadrifascita was more effective against gram-positive than gram-negative strains, especially against S. aureus and methicillin-resistant S. aureus compared to T. angustula extract, by a mechanism that involves disturbance of the bacterial cell membrane integrity. The aim of the present study was to survey the protective effect of pretreatment with Persian honey on amelioration of side effects of chemotherapy and ischemia/reperfusion induced testicular injury. Forty adult's male wistar rats were divided into four groups of ischemia-reperfusion (IR), honey + ischemia-reperfusion (HIR), Busulfan (B) and Busulfan intraperitoneally+ honey (BH). The seminiferous tubules were rated for their modified spermatogenesis index (SI) by Johnsons score. Detection of single- and double-stranded DNA breaks at the early stages of apoptosis was performed using the in-situ cell death detection kit. Total serum concentration of Follicle-stimulating hormone (FSH) , Luteinizing hormone (LH) and testosterone was measured using ELISA. All data were expressed as mean ± SD and significance was set at p ≤ 0.05. Honey improved SI in the HIR and BH groups and serum levels of FSH and LH in the BH and HIR groups (p < 0.001). Also, serum levels of testosterone were significantly higher in BH and HIR groups. But, apoptotic cells in IR and B groups significantly increased (p < 0.001), while in HIR and BH groups, the number of apoptotic cells decreased and the positive cells of TUNEL (TdT-mediated dUTP-X nick end labelling) staining were detected in spermatocytes and spermatid. Pretreatment with honey protect testis against chemotherapy and testicular IR injury, increase FSH and LH and testosterone and decrease the cellular damage and apoptosis. Honey can decrease the side effects of chemotherapy on reproductive system and prevent sterility. The effect of the use of thyme honey in minimizing radiation - induced oral mucositis in head and neck cancer patients: A randomized controlled trial. Radiation-induced oral mucositis is one of the main side effects during and after the treatment of head and neck cancer patients. The study was designed to provide evidence on the effectiveness of thyme honey on oral mucositis management. 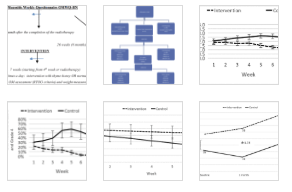 This was a randomised controlled trial (RCT) with 72 head and neck cancer patients who were divided either to the intervention group (thyme honey rinses) or to the control group (saline rinses). Oral mucositis was assessed according to the Radiation Therapy Oncology Group (RTOC criteria), and assessments were performed weekly starting at the 4th week of the radiotherapy for seven weeks and repeated once 6 months later. Additionally, the Oral Mucositis Weekly Questionnaire (OMWQ) was given at 4th week of radiotherapy, 1 month after the completion of radiotherapy and 6 months later. The ClinicalTrials.gov Identifier for this study is NCT01465308. This paper reports on the findings regarding thyme honey's effectiveness on oral mucositis. Generalized estimating equations revealed that patients in the intervention group were graded lower in the objective assessment of oral mucositis (p < 0,001), maintained their body weight (p < 0,001) and showed an improvement in their global health (p = 0.001) compared to the control group. Quality of life of the patients in the same group was also statistically significantly higher than that of the patients of the control group (p < 0,001). The study provided evidence on the positive effect of thyme honey on the management of radiation-induced oral mucositis and quality of life in head and neck cancer patients. The meeting, organised by the Romanian Apitherapy Society (Apimondia member), in collaboration with Apimondia (the International Federation of Beekeepers’ Associations), will address the most relevant issues pertaining to apitherapy and the qualitative aspects of the production/use of bee products and is open to researchers, medical doctors, pharmacists, biochemists, biologists, therapists, students as well as to beekeepers. 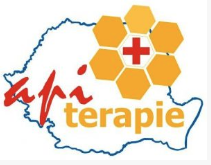 The symposium will include: oral presentations, a poster session, keynote speakers, specific sessions (active compounds, properties, pharmacology and clinical applications of hive products; clinical aspects in human and veterinary medicine; best practices; residues in hive products; alkaloids in honey and pollen; standards and frauds) and practical training (practical demonstration and clinical evidence of apitherapy; on-field standard tools; innovative systems for beehives and hive products traceability). In this study, we administered specially developed chitosan/alginate nanoparticle encapsulated BV (CH/AL-BV) which has slow-releasing properties and mucosal adhesiveness to pig via nasal route and evaluate whether it can facilitate systemic immune response and improve clearance of porcine reproductive and respiratory syndrome virus (PRRSV). The CH/AL-BV-administered group with PRRSV vaccination showed significantly enhanced Th1-related responses including a high population of CD4+ T lymphocyte and cytokine mRNA levels including interferon-gamma (IFN-γ) and interleukin (IL)-12 and increased PRRSV-specific IgG levels. In the PRRSV challenge experiment, the CH/AL-BV group showed a significant decrease of viral burden in the sera and tissues (lung and bronchial lymph node) and mild interstitial pneumonia signs on both lung gross examination and microscopic evaluation with high levels of PRRSV-specific IgG and viral neutralizing antibody. CH/AL-BV also effectively induced not only Th1-related immune responses including increase in portion of CD4+ T lymphocyte, cytokines (IFN-γ and IL-12), and transcriptional factors (STAT4 and T-bet), but also stimulated IFN-γ-secreting cell families such as CD4+ T lymphocytes and Th/memory cells. Interestingly, the CH/AL-BV group showed decrease in PRRSV-specific immune-suppressive actions, including the T regulatory cell population and its related cytokines (IL-10 and TGF-β) and transcriptional factors (STAT5 and Foxp3). Therefore, nasal-delivered CH/AL-BV may effectively induce non-specific immune stimulating actions, particularly those related to Th1 responses and viral clearance activities against PRRSV infection. Based on these results, CH/AL-BV could be a promising strategy for overcoming the disadvantages of classical PRRSV vaccination and can be applied as a preventive agent against PRRSV and other viral diseases, particularly those with immune-suppressive characteristics. Melipona subnitida Ducke (jandaíra) is a stingless bee native to north-eastern Brazil, which produces geopropolis, a mixture of beeswax, plant resins, pollens and earth that is used for sealing beehives. To extend the knowledge on phenolic compounds in fractions obtained by C18-solid phase extraction (SPE) of nine geopropolis samples from Melipona subnitida collected at different times. Chromatographic profiles of nine samples of geopropolis from jandaíra were analysed by ultra-performance liquid chromatography coupled with a diode array detector and quadrupole time-of-flight mass spectrometry (UPLC-DAD-QTOF-MS/MS) and combined with the use of data-independent acquisition (MSE) for the profiling and structural characterisation of the phenolic compounds. The isolated compound was identified by nuclear magnetic resonance of hydrogen and carbon (1 H- and 13 C-NMR). The present study with geopropolis of jandaíra resulted in the characterisation of 51 phenolics by UPLC-DAD-QTOF-MS/MS: four galloyl glucosides, one ellagic acid, 11 acyl-hexosides, 23 acyl-galloyl-hexosides and 12 flavonoids. The structures of two compounds (1,6-di-O-(E)-coumaroyl-2-O-galloyl-β-d-glucopyranoside and 1-O-cinnamoyl-6-O-(E)-coumaroyl-2-O-galloyl-β-d-glucopyranoside) were established by 1 H and the attached proton test (APT) experiments as well as high-resolution electrospray ionisation mass spectroscopy (HR-ESI-MS) analysis. The geopropolis of jandaíra showed phenolic compounds galloyl hexosides, ellagic acid, acyl-(cinnamoyl/coumaroyl)-hexosides, acyl-(cinnamoyl/coumaroyl)-galloyl-hexosides and flavonoids (aglycones and acylated-O-glycosides). The combination of lower concentrations of antitumor drugs (carboplatin - CARB, doxorubicin - DOX, and methotrexate - MET) with propolis was investigated against canine osteosarcoma (spOS-2) and mesenchymal stem cells (MSC) in vitro. The mechanism of action in the combinations was analyzed. spOS-2 cells were incubated up to 72 h with propolis (50 μg/ml) alone or in combination with CARB (10-400 μmol/l), DOX (0.5-2 μmol/l) or MET (50-200 μmol/l). Cell viability was assessed by MTT assay, apoptosis/necrosis by flow cytometry, and MSC was incubated with the optimum combination. Propolis alone exerted no cytotoxic action against spOS-2 cells, whereas CARB (400, 200 and 100 μmol/l) exhibited the highest cytotoxic effects comparing to DOX and MET. The combination of propolis with the lowest concentrations of CARB led to better results comparing to CARB alone, which was not observed using DOX and MET. Apoptosis was involved in the action of propolis + CARB in spOS-2 cells. MSC were not affected by CARB/propolis, indicating that the cytotoxic action of the combination was specific to tumor cells but not to normal ones. Propolis improved the action of CARB against spOS-2 cells using lower concentrations of this drug, without affecting MSC. These findings are relevant and indicate a possible application of propolis in OSA treatment. Pasteurella multocida continues to pose a danger to prone farm and wild animals all over the world. Chemotherapeutic treatments are progressively losing their effectiveness, last for long time, and cost a lot of money, as well as being toxic to human consumers. Therefore, clearing the way for immunization as a big-wheel alternative against the economic grain. Yet, the vaccines available in the market do not confer the necessary protection against the pathogen. The integration of the well adjuvanted killed vaccine with the attenuated vaccines proved to offer an effective protection to the host animals. However, the bare use of the killed bacterin to provide protection from the possible harm of the live attenuated vaccine was doubtful. In the present study, propolis extracts were used to ameliorate the immunogenicity of the Pasteurella bacterin. The cellular and humoral activities were assessed for the different bacterin formulations. Propolis extracts adjuvants proved to broaden and extend the IgG potency, as well as to induce a unique mucosal protection against the bacterium. Simultaneously it offered an anti-inflammatory effect that increased the tolerability to the bacterin. While the cellular activity was relatively reduced with propolis extracts. These results confirm the effectiveness of the formulation of the bacterin with propolis to offer a potent homologous primary protection to the animals against the long-life use of the attenuated Pasteurella vaccines. 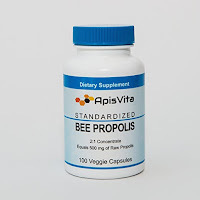 Propolis is a well-known bee product containing more than 2000 identified compounds. It has many beneficial effects on human health that include antibacterial, antiviral, anticancer and hepatoprotective justifying its use as a dietary supplement. Platelet aggregation plays crucial role in thrombus formation that can cause stroke or heart attacks. As cardiovascular diseases, including those caused by thrombus formation, are related to 50% of deaths of Western population, the objective of this study was to determine antiaggregatory activity of propolis on platelet aggregation on the whole blood samples. Twenty one propolis samples from Southeast Europe were characterized by spectrophotometric methods to determine content of the total flavonoids and phenolic acids. High performance liquid chromatography coupled with diode array detection was used to identify and quantify individual polyphenols. Platelet aggregation was tested by impedance aggregometry on the whole blood samples of ten healthy volunteers. The mean content of total polyphenols was 136.14 mg/g and ranged from 59.23 to 277.39 mg/g. Content of total flavonoids ranged between 6.83 and 55.44 mg/g with the mean value of 19.28 mg/g. Percentage of total phenolic acids was in the range 8.79 to 45.67% (mean 26.63%). Minimal antiaggregatory concentration, representing the lowest concentration of propolis extract sample that can cause statistically significant reduction of aggregation, ranged from 5 μM to 10.4 mM. Samples of propolis with lower content of luteolin and higher content of pinocembrin-7-methyleter showed better antiplatelet activity i.e. lower values of minimal antiaggregatory concentration. This is the first study that shows antiaggregatory potential of propolis ethanolic extracts on the whole blood samples in the low micromolar concentrations suggesting that propolis supplementation may influence platelet aggregation and consequently thrombus formation. Further in vivo studies are needed to confirm the beneficial effects in prevention of cardiovascular diseases. 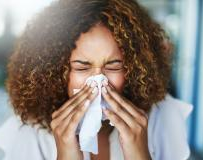 For those who suffer from hay fever, enjoying all that summer has to offer is far easier said than done. As beautiful as the weather can be, attempting to make the most of it can seem fruitless when you have to simultaneously endure a runny nose, itchy eyes and a persistent cough. The aim of the present study was to examine the antioxidant and antibacterial activity of 21 types of honey derived from Mount Olympus (Mt. Olympus), a region with great plant biodiversity. The antibacterial activity was examined against the growth of Staphylococcus aureus (S. aureus) and Pseudomonas aeruginosa (P. aeruginosa) by the agar well diffusion assay and the determination of the minimum inhibitory concentration (MIC). The antioxidant activity was assessed by using the 2,2‑diphenyl‑1‑picrylhydrazyl (DPPH) and 2,2'‑azino‑bis(3‑ethylbenzothiazoline‑6‑sulphonic acid (ABTS•+) free radical scavenging assays. These activities were compared to Manuka honey which is used as an alternative medicine. The results revealed that all tested honey types exhibited antibacterial activity against S. aureus and P. aeruginosa. The MIC of the tested honey types against S. aureus ranged from 3.125 to 12.5% (v/v), while MIC of Manuka honey was determined to be 6.25% (v/v). The MIC values of the tested honey types against P. aeruginosa ranged from 6.25 to 12.5% (v/v) and the MIC of Manuka honey was determined at 12.5% (v/v). Moreover, the results suggested that the presence of hydrogen peroxide and proteinaceous compounds in the honey types accounted, at least in part, for the antibacterial activity. 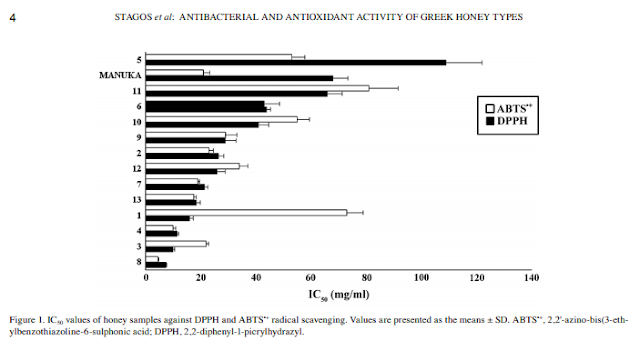 In addition, the total polyphenolic content (TPC) of the honey types seemed to contribute to the antibacterial activity against P. aeruginosa. Furthermore, some of the tested honey types exhibited potent free radical scavenging activity against DPPH and ABTS•+ radicals, which was greater than that of Manuka honey. The results indicated that not only the quantity, but also the quality of the polyphenols were responsible for the antioxidant activity. Moreover, four honey types exhibiting great antioxidant activity were converted to powder using a freeze drying method. The results indicated that following conversion to powder all honey types, apart from one, retained their antioxidant activity, although their TPC was reduced. In the several types of amyloidoses, participation of oxidative stresses in the pathogenesis and the effect of antioxidants on amyloidosis have been reported. Meanwhile, the relationship between oxidative stresses and pathogenesis of amyloid A (AA) amyloidosis is still unclear. In this study, we used an antioxidant, Brazilian propolis, to investigate the inhibitory effects on AA amyloidosis. The results showed that AA deposition was inhibited by administration of propolis. Increased expression of antioxidant markers was detected in molecular biological examinations of mice treated with propolis. Although serum amyloid A (SAA) levels were strongly correlated with the immunoreactive area of AA deposits in the control group, the correlation was weaker in the propolis-treated groups. In addition, there were no changes in SAA levels between the control group and the propolis-treated groups. The results indicate that propolis, an antioxidant, may induce inhibitory effects against AA amyloidosis. 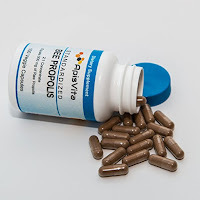 Propolis has been extensively used to improve health and prevent inflammatory diseases. Different types of Cuban propolis (red, brown and yellow) have been documented. The purpose of this research was to investigate the cytotoxic effects of Cuban red propolis (CP) on MDA MB-231 cell line, since breast cancer is considered one of the most common causes of mortality among women. Antiproliferative and cytotoxic activity of CP against MDA MB-231 cells were determined by the 3-[4,5-dimethylth-iazol-2-yl]-2,5-diphenyl tetrazoliumbromide (MTT) and lactate dehydrogenase (LDH) assays. Apoptosis/necrosis, involvement of PI3K/Akt and ERK1/2 pathways, mitochondrial membrane potential and expression of genes were investigated. CP extract exhibited antiproliferative and cytotoxic effects on MDA MB-231 cells, what may be probably related to PI3K/Akt and ERK1/2 pathways. A decreased expression of apoptosis-related genes (TP53, CASP3, BAX and P21) was seen, whereas the expressions of BCL-2, BCL-XL, NOXA and PUMA were unaffected. CP extract induced mitochondrial dysfunction and LDH release, what indicated cell necrosis associated with reactive oxygen species production and decreased cell migration. Our findings provide a basis for future investigation of chemopreventive and/or therapeutic studies against apoptosis-resistant breast cancer, in animals and humans. Honey has successfully been used in treatment of a broad spectrum of injuries including burns and non-healing wounds. It acts as antibacterial and anti-biofilm agent with anti/pro-inflammatory properties. However, besides these traditional properties, recent evidence suggests that honey is also an immunomodulator in wound healing and contains several bee and plant-derived components that may speed up the wound healing and tissue regeneration process. Identifying their exact mechanism of action allows better understanding of honey healing properties and promotes its wider translation into clinical practice. This review will discuss the physiological basis for the use of honey in wound management, its current clinical uses, as well as the potential role of honey bioactive compounds in dermal regenerative medicine and tissue re-modelling. There are a number of disorders that affect the gastrointestinal tract. Such disorders have become a global emerging disease with a high incidence and prevalence rates worldwide. Inflammatory and ulcerative processes of the stomach or intestines, such as gastritis, ulcers, colitis, and mucositis, afflict a significant proportion of people throughout the world. 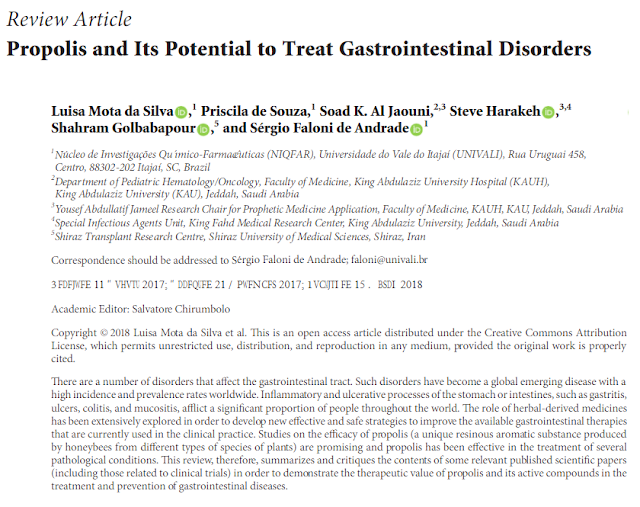 The role of herbal-derived medicines has been extensively explored in order to develop new effective and safe strategies to improve the available gastrointestinal therapies that are currently used in the clinical practice. Studies on the efficacy of propolis (a unique resinous aromatic substance produced by honeybees from different types of species of plants) are promising and propolis has been effective in the treatment of several pathological conditions. 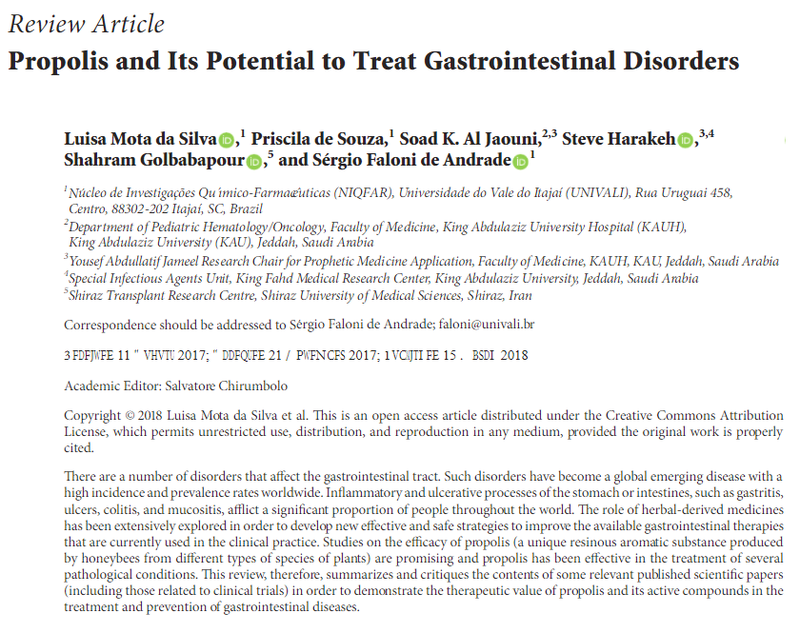 This review, therefore, summarizes and critiques the contents of some relevant published scientific papers (including those related to clinical trials) in order to demonstrate the therapeutic value of propolis and its active compounds in the treatment and prevention of gastrointestinal diseases. Alcoholic propolis extracts may be used to eliminate microbes in mucous membranes and skin inflammations and in wound infections. The aim of this study was an assessment of the ethanol extract of propolis (EEP) activity against biofilm formation by P. mirabilis. Six clinical strains of P. mirabilis isolated from patients with chronic wound infection, and one reference strain of P. mirabilis ATCC 29906 were used. Biofilm was formed in 96-well plate. In order to evaluate the effect of EEP at a concentration range of 1.56-100 mg/mL on the forming and mature biofilm, P. mirabilis cells were released by sonication. In this study the effectiveness of 25-100 mg/mL of EEP on the forming P. mirabilis biofilm and concentrations of 25-50 mg/mL of EEP on formed biofilm has been demonstrated. Our results suggest the possibility of using the EEP in treatment of chronic wound infection caused by P. mirabilis. Brazilian green propolis is produced by mixing secretions from Africanized honey bees with exudate, mainly from Baccharis dracunculifolia. Brazilian propolis is especially rich in flavonoids and cinammic acid derivatives, and it has been widely used in folk medicine owing to its anti-inflammatory, anti-viral, tumoricidal, and analgesic effects. Moreover, it is applied to prevent metabolic disorders, such as type 2 diabetes and arteriosclerosis. Previously, we demonstrated that propolis ethanol extract ameliorated type 2 diabetes in a mouse model through the resolution of adipose tissue inflammation. The aims of this study were to identify the immunosuppressive cells directly elicited by propolis extract and to evaluate the flavonoids that induce such cells. Ethanol extract of Brazilian propolis (PEE; 100 mg/kg i.p., twice a week) was injected into lean or high fat-fed obese C57BL/6 mice or C57BL/6 ob/ob mice for one month. Subsequently, immune cells in visceral adipose tissue and the peritoneal cavity were monitored using FACS analysis. Isolated macrophages and the macrophage-like cell line J774.1 were treated with PEE and its constituent components, and the expression of immune suppressive myeloid markers were evaluated. Finally, we injected one of the identified compounds, kaempferol, into C57BL/6 mice and performed FACS analysis on the adipose tissue. Intraperitoneal treatment of PEE induces CD11b+, Gr-1+ myeloid-derived suppressor cells (MDSCs) in visceral adipose tissue and the peritoneal cavity of lean and obese mice. PEE directly stimulates cultured M1 macrophages to transdifferentiate into MDSCs. Among twelve compounds isolated from PEE, kaempferol has an exclusive effect on MDSCs induction in vitro. Accordingly, intraperitoneal injection of kaempferol causes accumulation of MDSCs in the visceral adipose tissue of mice. Brazilian PEE and its compound kaempferol strongly induce MDSCs in visceral adipose tissue at a relatively early phase of inflammation. Given the strong anti-inflammatory action of MDSCs, the induction of MDSCs by PEE and kaempferol is expected to be useful for anti-diabetic and anti-inflammatory therapies. 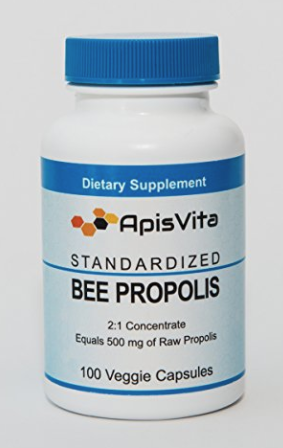 Propolis is a natural bee product, and it has many effects, including antioxidant, anti-inflammatory, antihepatotoxic, and anticancer activity. In this study, we aimed to explore the potential in vivo anti-inflammatory, antioxidant, and antiapoptotic properties of propolis extract on lipopolysaccharide (LPS)-induced inflammation in rats. Forty-two, 3- to 4-month-old male Sprague Dawley rats were used in six groups. LPS (1 mg/kg) was administered intraperitoneally to rats in inflammation, inflammation + propolis30, and inflammation+propolis90 groups. Thirty milligram/kilogram and 90 mg/kg of propolis were given orally 24 h after LPS injection. After the determination of the inflammation in lung and liver tissues by 18F-fluoro-deoxy-d-glucose-positron emission tomography (18FDG-PET), samples were collected. The levels of malondialdehyde (MDA), superoxide dismutase (SOD), catalase (CAT), nitric oxide (NO), and DNA fragmentation were determined. The decrease of MDA levels in inflammation + propolis30 and inflammation + propolis90 groups was determined compared to the inflammation group in lung and liver tissues. The increase of SOD% inhibition in inflammation + propolis90 group was determined in liver, lung, and hemolysate compared to the inflammation group. Increased CAT activities in inflammation + propolis30 and inflammation + propolis90 groups were observed in liver tissue and hemolysate compared to inflammation group. In lung tissue, NO levels were lower in inflammation group compared to the control group, but DNA fragmentation levels were higher. 18F-FDG uptake of tissues in inflammation + propolis30 and inflammation + propolis90 groups was decreased compared to the inflammation group. In conclusion, the data of this study indicate that the propolis application may serve as a potential approach for treating inflammatory diseases through the effect of reducing inflammation and free oxygen radical production. Propolis is a bee-collected natural product that has been proven to have various bioactivities. This study tested the effects of a Mexican propolis on streptozotocin-induced diabetes mellitus in a murine model. The results showed that an ethanolic extract of propolis of Chihuahua (EEPCh) significantly inhibited increases in blood glucose and the loss of body weight in diabetic mice. EEPCh increased plasma insulin levels in STZ-diabetic mice, whereas, in untreated diabetic mice, there was no detection of insulin. EEPCh had a high antioxidant capacity (SA50 = 15.75 μg/mL), which was directly related to the concentrations of total phenols (314 mg GAE/g of extract) and flavonoids (6.25 mg QE/g of extract). In addition, increased activities of the enzymes superoxide dismutase, catalase, and glutathione peroxidase were observed in diabetic mice treated with EEPCh. Compounds such as pinocembrin, quercetin, naringin, naringenin, kaempferol, acacetin, luteolin, and chrysin were identified by HPLC-MS analysis. This investigation demonstrated that propolis of Chihuahua possesses hypoglycaemic and antioxidant activities and can alleviate symptoms of diabetes mellitus in mice. These effects may be directly related to the chemical composition of propolis, as most of the compounds identified in propolis are reportedly active in terms of the different parameters evaluated in this work. This study aimed to determine the prevalence, determinants and pattern of herbal medicine use among hypertensive patients in Freetown. We conducted a cross-sectional study among hypertensive patients attending public and private health facilities in Freetown, Sierra Leone between August and October 2016. We analyzed the data using SPSS version 24. We used Chi-square, Fisher exact two-tailed test and regression analysis for data analysis. A p-value less than 0.05 was considered statistically significant. Out of 260 study participants, over half (n = 148, 56.9%) reported using herbal medicine for the treatment of hypertension alone or together with comorbid condition(s). The most commonly used herbal medicine among users were honey (n = 89, 33.3%), moringa (n = 80, 30.0%) and garlic (n = 73, 27.3%). No significant difference existed between users and non-users of herbal medicine with regards to socio-demographic and health-related factors. The majority (n = 241, 92.7%) of respondents considered herbal medicine beneficial if it was recommended by a healthcare provider yet 85.1% (n = 126) did not disclose their herbal medicine use to their health care provider. There is a high use of herbal medicines among hypertensive patients in Freetown, Sierra Leone. It is essential for healthcare providers to take heed of the findings of this study and routinely ask their patients about their herbal medicine use status. Such practice will provide the opportunity to discuss the benefits and risks of herbal medicine use with the aim of maximizing patient desired therapeutic outcomes.